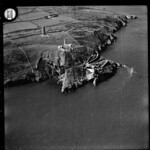 The following photogarph is from the Irish Defence Archive’s Flickr Feed. You can click through to their feed – they have a photograph identification project under way at the moment. This sign is either overgrown or has been removed. The lighthouse in question is now a holiday home.